Raghunandan Swarup Pathak aka R. S. Pathak was the son of the former Vice President of India – G. S. Pathak. He is best known as for his post as the 18th Chief Justice of India. Talking about his professional life, R. S. Pathak was one of the 3 judges that were an esteemed part of the International Court of Justice. Other Indian Judges with R. S. Pathak were Justice Nagendra Singh and Justice Dalveer Bhandari respectively. He is acclaimed for his role in the Bhopal Gas Tragedy. Raghunandan Swarup Pathak was a student of St. Joseph College in the Allahabad city of Uttar Pradesh state of India. He studied Law at the prestigious Allahabad University. Later he became a judge at the Allahabad High Court in the year 1962. After serving as the judge of the esteemed Allahabad High Court for years, Judge R. S. Pathak became the Chief Justice of the Himachal Pradesh High Court in 1972. Raghunandan Swarup Pathak was nominated to the Supreme Court of India by the then CJI Yeshwant Vishnu Chandrachud, who was the head of Collegium of judges at that time. R. S. Pathak became a judge at Supreme Court of India in 1978. After replacing Justice P. N. Bhagwati, in the year 1986, judge Pathak was made the 18th Chief Justice of India. He was appointed by the then President of India – Giani Zail Singh. He was responsible for bringing relative peace to the Indian judicial system. In his tenure of over Two and half years as the Chief Justice of India, R. S. Pathak appointed dozens of judges from around the India in the Supreme Court. In the year 1989, he was replaced by Judge E. S. Venkataramiah. Bhopal Gas Tragedy resulted in the death of thousands of individuals in the Bhopal city of Madhya Pradesh state. The government of India filed a criminal suit against the Union Carbide Corp, the dispute went to the Supreme Court of India. The government of India had claimed a settlement of over $3.3 Billion USD, however, India received a little over $470 million USD from the American Union Carbide. The settlement was monitored by R. S. Pathak and it resulted in dropping of criminal charges against the company. He became an esteemed member of prestigious International Court of Justice after retirement. R. S. Pathak garnered limelight on his swift action of giving judgement in the favour of Union Corp.
From 1989 to 1991, Raghunandan Swarup Pathak served as the Judge at International Court of Justice at The Hague. In 2005, R. S. Pathak was selected to chair to enquiry into a case of Oil-for-Food Programme. In lieu of his report, the sacking of various Congress leaders, as well as the former External Affairs Minister Natwar Singh, was possible. Pathak committee submitted a 110-page report to the Government of India citing that K. Natwar Singh and his son Jagat Singh were involved in the contract mismanagement for the UN’s oil-for-food programme. 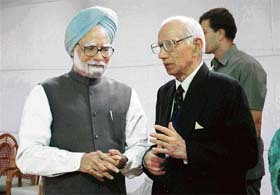 Justice Raghunandan Swarup Pathak died of heart attack in the year 2007, he was 82 years old at that time.